More protection for migratory routes is needed, according the the studies. Two new studies just released are saying the routes that migratory birds and marine species use are lacking protection from things like over-fishing because of poor conservation management efforts around the world, says an article on foxnews.com. One of the studies found that over 90 percent of the migratory bird routes are not protected adequately, and another study’s findings reports that the routes of over 17,000 marine species across the globe are still unprotected for the most part. The latter study, published in Scientific Reports, found over 97 percent of the species studied have less than 10 percent of their migratory range in protected marine areas. The study looked at the routes of 17,348 species overall, and found that the nations with the largest number of species whose range is completely outside of a protected area include the United States, Canada and Brazil. Ben Halpern, of UC Santa Barbara and the National Center for Ecological Analysis and Synthesis said in a statement that there has been an increase in marine protected areas (MPAs) in recent years, but most of the increase has come from a very few large MPAs. He added that the large MPAs are important, but species around the world need protection and not just the ones in the large areas, saying the study team’s findings point out where the gaps in protection are. The team also acknowledges that there are efforts to add 10 percent to marine environments for more protection by the year 2020, which will result in almost 3.8 million square miles of MPAs created in the last ten years. 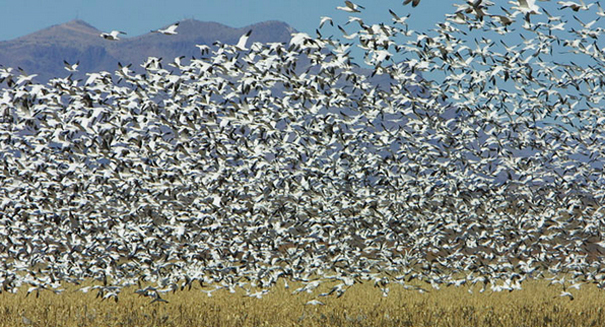 The second study, published in the journal Science, says migratory birds are not faring much better. That study found of 1,451 migratory bird species studied, 1,324 lacked protection on at least some part of their journey, and 18 species had no protection at all on their migratory route. Claire Runge, of the ARC Centre of Excellence for Environmental Decisions (CEED) and the University of Queensland, who led the study published in Science, said in a statement that more than half of the migratory bird species have suffered serious population declines over the past 30 years, due mainly to ineffective protection in places where the birds stop to re-fuel along their paths. She adds the birds not only need to have their breeding grounds protected, but a typical migratory route has a number of geographic locations where the birds stop for food and rest, adding these areas need to be protected as well to allow the populations to stabilize. Greater efforts to create more protected areas for the travelers, and to increase the areas already in existence, were called for in both of the studies.